During the first weekend an iMac was in my hands, I used its media facilities via the remote control and Front Row. This is on all Macs now and from it there is easy access to music, photographs and visual media on the iMac itself, or any other machine on the same network. It gave me a little luxury as I could work on my MacBookPro and select music from the iMac sitting across the room, while the music was stored on the computer I was working at. I later viewed some video podcasts in the same way. Some people have suggested that the remote control itself is a little fiddly, but it is fairly easy to get used to: I use it when making presentations and it is far easier than using my Ericsson phone that I used previously (via Salling Clicker and Bluetooth). When navigating the phone functions on a good day my thumbs are too big. After looking at the TV guide, I decided to run a DVD using Front Row. The colours on the screen were rich and sharp. I ran The Motorcycle Diaries first and on the second weekend, The Great Gatsby. At work a colleague viewed Cats and expressed himself much satisfied. The quality of the speakers was more than simply adequate. They are angled down, beneath the iMac, which means that they reflect the sound. For anyone used to watching an older CRT television, the wide screen and the speakers are improvements. 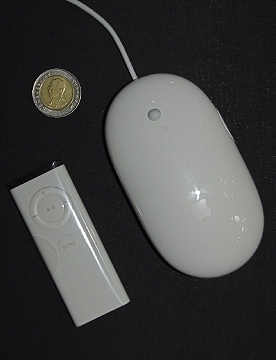 Pre-installled were the usual Apple programs including iLife. Apart from a trial version of Microsoft Office for the Mac, I found no third party applications. A new Airport Disk Utility is installed which finds disks linked by WiFi. With this, I installed a menubar icon for swift access to networked disks. 802.11n (draft) standard WiFi is available as standard on the iMacs as well as 10/100/1000BASE-T (Gigabit) Ethernet. 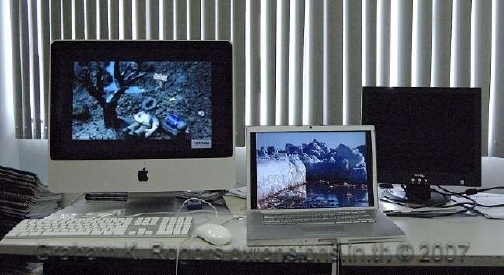 The overall finish of the iMacs is high, as one expects from Cupertino products. 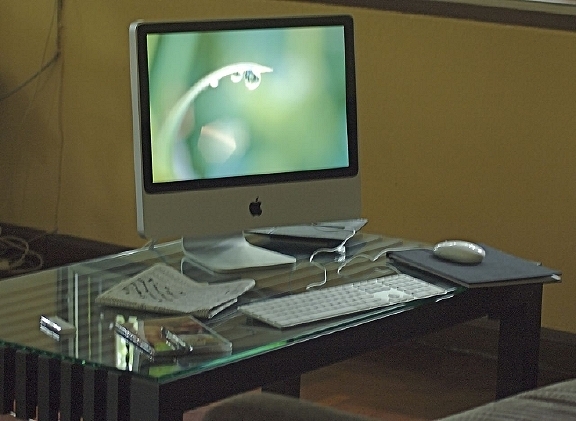 The iMac is certainly lighter (9.1Kg) than my own eMac, but moving it up and down stairs, or to and from the office, was not as easy as I expected. It is mobile, but is not a computer to carry around often. 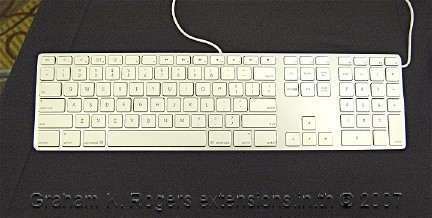 The thin keyboard was better to work on than the current Mac keybaords I use. The key travel is so short (the keys are only 2mm thick) that I found it more accurate than my notebook computer. The multi-function mouse did not like my glass table. When I used a non-reflective surface like a book it was fine. At work, I installed it in the IT Department. They have a new Windows server and specific needs. A minor problem came with the trial version of Microsoft Office. All documents are accessible from the server, but a Thai language file opened with no text visible. Using the Lucida Grande font, the text reappeared (that font has all characters). Things improved when I installed the Thai fonts which had been left off. The trial version of Office only works in an Administrator account. One has to trust that user accounts will be properly served if a full version is purchased. As such documents can also be opened in Text Edit, I confirmed that the particular file worked. I also installed NeoOffice, which opened the file with no problem. My own computers are Microsoft-free zones and I function perfectly without Redmond: text, spreadsheets, presentations. One of the IT Department's needs was that all computers should be protected. Although there are no viruses for OS X, the more people from the Windows world begin to use Macs, the more their fears outweigh the realities. There is insistence in some quarters on protection being installed. My own computers do not have virus protection: strong passwords, a firewall, careful account creation and use are all part of my armoury. OS X is not Windows, so the same rules do not apply. One, "maybe", from Symantec spreads much unnecessary panic. Nonetheless, our IT department insists on feeling safe. We put on a protection suite from Computer Associates with installations for Windows, Unix and Linux systems as well as for OS X. The program ran a complete check. Nothing was found. The CA program usually reports back to the server. The iMac did not oblige so CA was contacted. Late in the week they told us that the Apple plug-in for Active Directory needs to be installed. This is found in Directory Access, a security utility on Macs. Apart from these minor points, the fews days that the iMac was in the Department were useful. 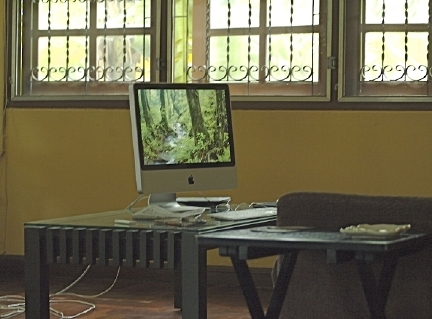 With the full complement of pre-installed software the iMac was ready to run in the office environment. With a couple of tweaks it was easy to integrate it into the extant networking with its security requirements. See also last week: "First Impressions of the iMac"